STOCKHOLM / ROME, Jan 28 2019 (IPS) - In 1989 I watched Back to the Future, Part II by Robert Zemickis, a complicated story about a youngster who from 1985 time travelled to 2015. 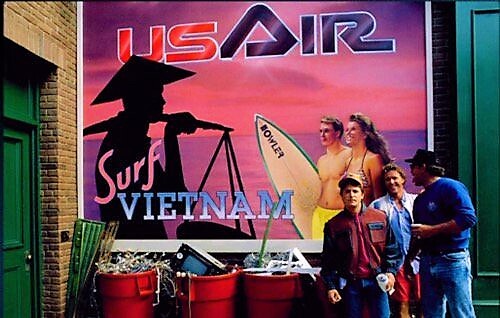 Within the movie I spotted a poster from the imaginary 2015: US AIR Surf Vietnam. Back in 1989 I associated Vietnam with the war that lasted from 1955 to the fall of Saigon in 1975 and by different media was brought into the homes of millions, radicalizing and engaging youngsters, not the least me. Catching sight of the poster I associated it with a scene in Francis Ford Coppola´s masterpiece Apocalypse Now, where a gung-ho US Colonel ordered his troops to attack a fishing village so he and his men could go surfing on its beach. Like the entire movie the episode commented on the absurdity of a high-tech superpower using bewildered youngsters to wage war on people who with primitive means defended their homeland. Of course, reality was more complicated than that, though the Vietnam War was soon turned into a mythological fight between good and evil. In 1989, a poster advertising Vietnam as a tourist destination for American surfers seemed to be quite absurd. Many Americans still feared the Vietnamese as merciless enemies and the country suffered from a US imposed trade embargo. At the time I watched the movie, I could not imagine that I in the near future would move to Vietnam with my family. Then, just like now, Vietnam was a one-party state governed by the Communist Party. Being a member of other political parties was not allowed. Human rights were severely restricted and long prison sentences were meted out to those who criticized the regime, or the widespread corruption. Nevertheless, Vietnam was in those days a completely different world from what it is now. Back then it was a poor country, scarred by the war, with veterans who told stories about abuse and terror, both from American invaders and their own Government. Hanoi was infested by rats, its streets clogged by bicycles. When I drove our heavy Soviet Volga (it was first after a year we bought a Toyota) I felt like a shark swimming through shoals of small fish. We lived a privileged life, we were free to move around in the town but had to live in Van Phuc, a fenced area peopled by foreigners working for international organizations. Our entire time in Hanoi was overshadowed by dealings with The People’s Committee (Uỷ Ban Nhân Dân) and other governmental organizations, several of them infested by corruption. – I have money, but with a predatory government like ours it is not advisable to expose any wealth. Better times will come and then I will build a house and give my children an excellent education. – Why should I make such an effort when a foreigner like you would buy it anyway? – I sold it to a Chinese gentleman. Like you he appreciated an excellent work. Thanks to your suggestions I improved the cupboard and asked for a higher prize. I will give you a cup of tea instead. – I and my colleagues have seen that you often come here. Since you speak English we wonder if you could not stay one hour after closing time and teach us all English. We will pay you by giving you the books you want. – I really don´t know what they want from you. It´s not likely they want to know anything about religion, which is somewhat of a taboo here. I´ll tell them you may speak about Swedish culture. – We don´t want anything of that. We know this Swede is a historian of religions and what we want from him is something we don´t know much about. We want him to lecture us about Muslim fundamentalism and the organisation of the Jesuits. By the beginning of the 1990s Muslim fundamentalism was not yet such a great concern as it is now, but the Vietnamese government probably had an inkling about what would come. But, why were they interested in the Jesuits? Maybe this was also some kind of foreboding? Yesterday, a Jesuit friend of mine told me that the Society of Jesus enjoy its fastest growth in Vietnam. The country has now more Jesuit priests per capita than any other country. An amazing development considering that it was not until 2003 that the Society of Jesus began to function there as a religious institution. When I visited the country again in 2011, I found Hanoi to be a completely changed town, modern and prosperous. An impression which was reinforced when I met friends I had known during my first stay in Vietnam. They were all better off and considered the future with optimism. Could there after all be a relation between prosperity and authoritarianism? I hope not. A market economy reform, Đổi mới, was launched in 1984, making almost all farmers self-employed, transforming a rice importing country into the world’s third largest exporter of rice. The US embargo was lifted in 1994. Membership in the World Trade Organization has attracted over 22,000 direct investment projects, global groups like Samsung, LG, Toyota, Honda and Canon have selected Vietnam as a manufacturing base. A wealth of bilateral and multilateral free trade agreements has been signed. Tourism has become an important industry, but also manufacturing of shoes, textiles and food. In spite of all this I am inclined to consider the go-ahead spirit of my Vietnamese friends to be an outcome of their pragmatism, a result of war and the hardship suffered under totalitarianism, combined with state sponsored education and health care. I hope all this finally will result in a democracy and an unrestricted adherence to human rights.